The newer mud pots / mud volcanoes at the Salton Sea. These used to be invisible since they were covered with water. In the past couple of years, the Salton Sea has begun drying up and now these are are exposed. Note that you must hike about 3.5 miles each way - often through deep, sticky, and slippery mud/liquid clay to get here. I lost the sole of a hike shoe hiking back from here. A mudpot — or mud pool — is a sort of acidic hot spring, or fumarole, with limited water. It usually takes the form of a pool of bubbling mud. The acid and microorganisms decompose surrounding rock into clay and mud. The mud of a mudpot takes the form of a viscous, often bubbling, slurry. As the boiling mud is often squirted over the brims of the mudpot, a sort of mini-volcano of mud starts to build up, sometimes reaching heights of 3–5 feet. Although mudpots are often called "mud volcanoes", true mud volcanoes are very different in nature. The mud of a mudpot is generally of white to greyish color, but is sometimes stained with reddish or pink spots from iron compounds. When the slurry is particularly colorful, the feature may be referred to as a paint pot. 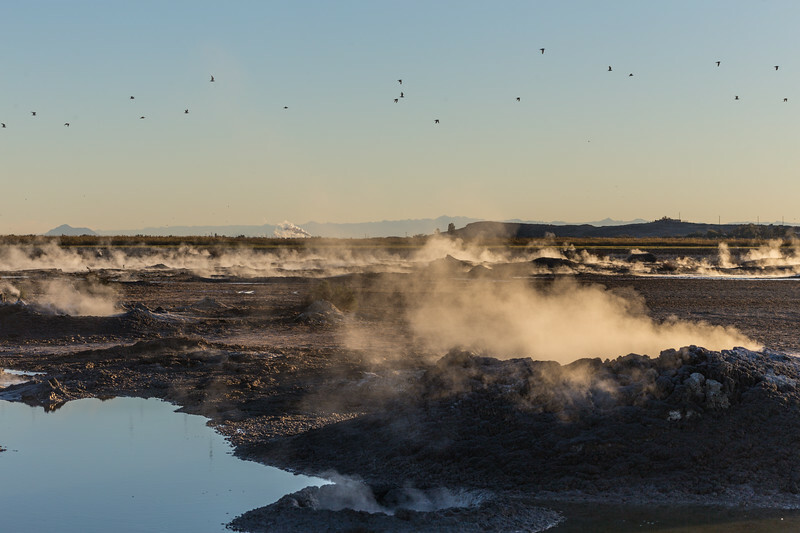 Mudpots form in high-temperature geothermal areas where water is in short supply. The little water that is available rises to the surface at a spot where the soil is rich in volcanic ash, clay and other fine particulates. The thickness of the mud usually changes along with seasonal changes in the water table.